Senator Bernie Sanders is defending his decision to do a townhall on Fox News, even after the DNC said that they will not let the network host a presidential debate. Bernie says that he wants to send a very clear and simple message to Fox viewers. That message is that Trump lied to him. A one-on-one setting might actually be the perfect way to get this message across to those viewers, as Ring of Fire’s Farron Cousins explains. When Bernie Sanders announced a week or so ago that he was going to be doing a town hall on Fox News, a lot of Democrats towards the center of the political spectrum. We’re angry. How dare he, how dare Bernie Sanders go on Fox News to talk to these people? The DNC is boycotting Fox News. We’re not going to let them host a debate. So Bernie is breaking ranks once again, causing chaos, throwing the entire party into disarray. And so finally, yesterday Bernie Sanders came out and he said, listen, Fox News is 100% of propaganda arm for the White House. Totally get it, understand it, but they’ve got an audience of millions of people. And I want to go on there and tell those millions of people. One simple message and that message is that Trump lied to you. Trump lied to you. And then he went on to explain the things Trump lied about, for example, that he was going to protect healthcare in the United States. And in reality, he’s trying to kick 20 to 40 million people off their health insurance by getting rid of Obamacare. He said he wasn’t going to touch Medicare, medicaid or social security, but oh no. The budget actually includes cuts for those programs. He lied to you again. 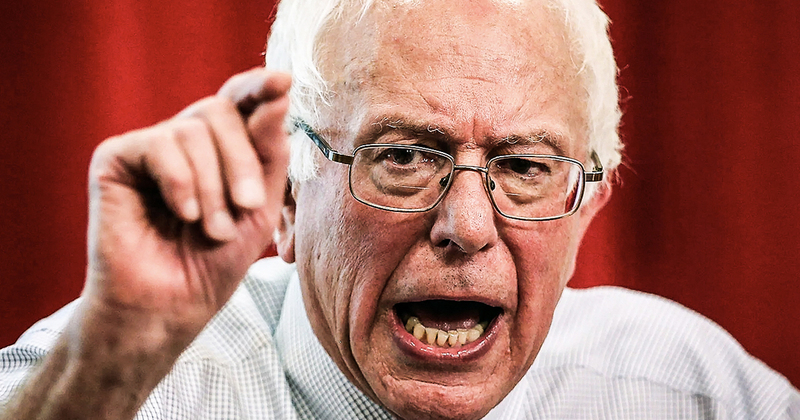 He has lied to you about everything and that is the message that Bernie Sanders wants to take onto Fox News. Now, for me personally, when I saw that he was going to do a town hall and Fox News, I wasn’t angry. I didn’t think he was breaking ranks. Each individual candidate can do a town hall with whatever network they want to, but as a party, I agree they should not, but I got to thinking at first again, it was okay, well you can do it, but what’s the point? You’re not going to change their minds. But after listening to him with his reasoning and his explanation, it actually does make a lot of sense because when you think about it this way, if there is a one on one, if you just have one person sitting there and explaining to you calmly and carefully and calculated how Donald Trump lied to you using specific examples and facts and figures and statistics, you can reach those people. The entire audience and Fox News is not gone. The hosts are, there is no reasoning with any of those people, but it’s not always the case with those viewers. And I think sometimes we miss that. But that is something you can do in a one on one town hall that you could not do with a 14 or 10 or even five person debate because there’s not enough time to elaborate. Everybody can spit out talking points, but you can’t spit out policy and statistics and things like that in any kind of meaningful way. Bernie’s reasoning makes a lot of sense and it helps to that he has faith in these people. He believes they’re not all too far gone. And to me that is a very positive message I asked more uplifting than saying something like, we all just need to work together. No, not saying we shouldn’t work together, but first you have to fix the underlying problem. And I think that’s what Bernie Sanders is after here. So after being a little wishy on it, at first, I’m fully convinced that this is the best path. Not only that, but I think other Democratic candidates should follow suit and calmly sit and talk to these Fox News viewers because many of them, most of them are still reachable. And Bernie Sanders is hoping that he can reach them and explained to them that everything this man told them he was going to do has been an absolute and utter lie.